You can’t walk a block in Puerto Natales without seeing a dog...or five. The dogs are everywhere, and especially in a tourist town like Puerto Natales, they notice you as much as you notice them. They can recognize a visitor from blocks away, and will trail you in an impromptu pack. Many appear healthy and well-fed, a sign that someone, somewhere is caring for them. A few will pass that have patches of missing hair. Frequently, dogs are limping - likely the victims of a fast moving car. 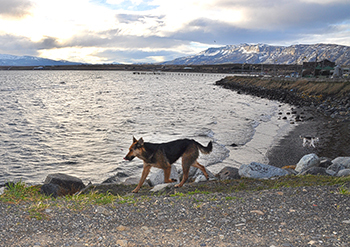 There are the dog problems that are readily apparent in Puerto Natales – sick and injured dogs in grave need of medical attention, and the ones barking or leaving messes in the street. There are also more serious issues dividing the community, including the large number of sheep these dogs kill each year, as well as the Echinococcus parasite these dogs pick up from the sheep and transfer to people, causing a serious condition in humans called Hydatid disease. The community’s concerns about the impacts of roaming dogs and their welfare is what brought me, Program Director Kate Atema and Mexico Project Coordinator Joaquin de la Torre to this Chilean city last week. Together with Veterinarians Without Borders Canada (VWB), we aim to improve the health and well-being of dogs and people in the city. 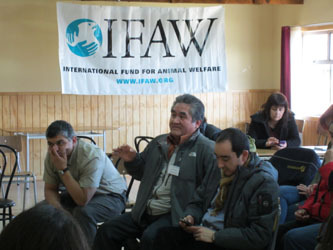 Last week marked the launch of the International Fund for Animal Welfare’s (IFAW) Humane Community Development (HCD) project in Puerto Natales. This process, which brings together key local stakeholders, is often the first time individuals on different sides of the issue come together to discuss and understand what’s happening with the dogs in their city. 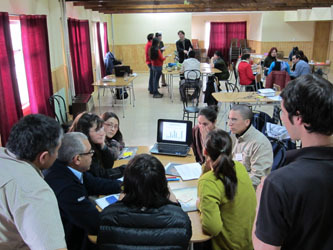 In Puerto Natales, stakeholders included representatives from the local government, departments of health and agriculture, social and animal organizations, local veterinarians and dog owners. With individuals from such varied backgrounds coming to tackle issues so often loaded with controversy and emotion, it’s no surprise there were points throughout the first day riddled with stress and strong language. One attendee immediately launched into a lecture about the disappointing, irresponsible behavior of another stakeholder group, punctuating her comments with an account of her husband being bitten by a dog, while others expressed apathy about anything ever improving. But IFAW’s HCD process has been constructed specifically to bring together communities with disparate viewpoints, and to help address emotional, controversial issues, and to finally build consensus around these problems. We are proud to say that in Puerto Natales this process was met with stunning success. Over the course of two days, local stakeholders participated in a series of activities exploring the problems faced by people and dogs in their community, the connection between human and animal health and well-being, the effect of current interventions, plus a small wealth of data that had already been collected on people and dogs in the city. We were able to help this group develop a common vision, see the critical importance of working together towards a common goal, and ultimately decide to take action to change their canine and human management practices for the better. Those who were initially not shy about expressing their skepticism and frustration as the workshop began became some of the most inspired attendees as it came to a close. “You’ve opened our eyes,” said one participant. “We wouldn’t have gotten to the conclusions we got today if we hadn’t worked as a group,” said another. “I learned that the problem isn’t dogs, it’s humans”. While this is a testament to the power of IFAW’s community engagement techniques, it is equally a testament to the people of Puerto Natales, and their willingness to address these issues head-on. Within this newly inspired group, there is the knowledge, leadership, and wherewithal to understand and address the human and dog welfare problems in their community. We are so pleased to have had the opportunity to work with VWB and the people of Puerto Natales. After a week in the city and two days of intensive work, IFAW is very hopeful that the momentum will continue. Over the next few months this community group will be collecting a wide variety of data and information, and then IFAW and VWB will return to help them develop a humane, sustainable dog management plan. In the long run, the successful creation and implementation of this plan will mean a far more positive story for dogs on the sidewalk: healthy, happy animals with healthy, happy people beside them. For more information about IFAW efforts to help communities with their animal welfare management challenges, visit our campaign pages.